As a reward for getting here, we’re giving you a FREE ebook from one of The City Bin Co.’s longest serving employees – Oisin Browne. Oisin’s business insights come from his time and experience with The City Bin Co. Having started on the back of the truck picking up trash, Oisin worked his way through the ranks into Sales, and became a shareholder in the company. 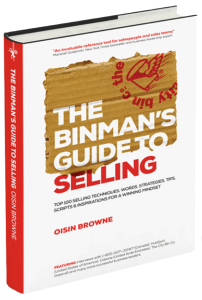 Oisin’s first book ‘The Binman’s Guide to Selling’ is an Amazon bestseller, and received international praise from top global business experts Marshall Goldsmith, Libby Gill, Verne Harnish, Jeffrey J.Fox and Al Ries. For more, check out http://www.binmansguide.com and to download your FREE copy click here.